Hello everyone! So I have a guide for you today. This is for those who are new to LUSH products with some advice, product recommendation and a general review of the products. I’m thinking about doing this sort of guide for other stores/brands such as Bath & Body Works, Maybelline and the list goes on. But today the focus is on LUSH. About LUSH: So LUSH is a cosmetics store that offers bath, body, and skincare products that are fresh and handmade. Big claims for a company but they have followed through and are very ethical in their business practices. The Products: LUSH is well-known for their soaps, bath bombs and bubble melts basically luxury in a bath. But have expanded their product line to shower gels, body moisturizers, massage bars, hair care, and lip care. 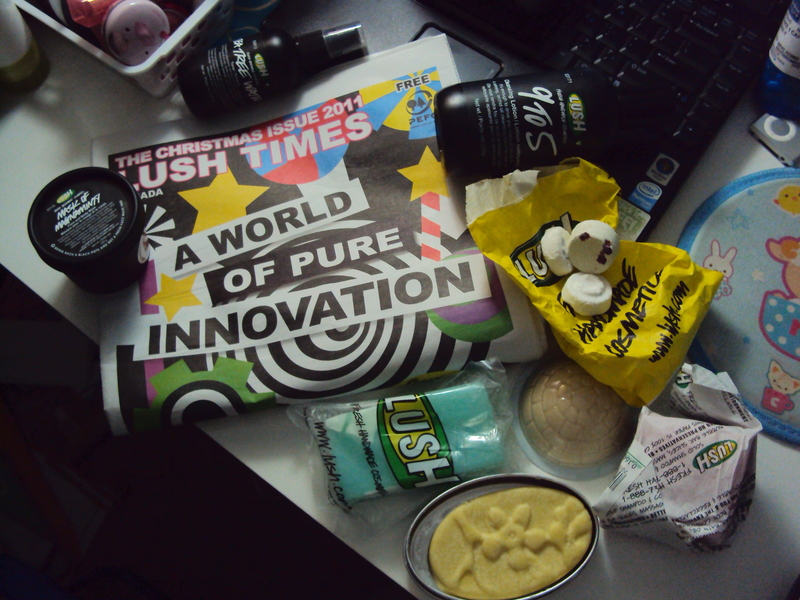 I don’t take baths (my mom forbids it thinking that it wastes water) so this sort of limits my selection from LUSH. But out of all the products I’ve tried I love and once I get my own bath tub I would love to try their bath bombs and bubble melts. Soaps: LUSH has many different kinds of soaps but since I love citrusy/fruity scents I’ve only picked out a few of my favourties which were the wintertime soaps. My favourites include Honey I Washed the Kids (even though it’s not fruity I still like it) and is one of LUSH’s top-selling soaps, Snowglobe only available during the wintertime and I stock up on it because it’s very refreshing; Bohemian another fresh lemon smelling soap, and Miranda which is a fruity soap with kiwis. All their soaps are bright colorful and work nicely into a lather. Massage Bar: My favourite out of them all is Each Peach (and two’s a pair!) due to the citrusy fresh scent. They have various other scents of vanilla, chocolate floral ones, and even glitter massage bars for those nights out. These last for an extremely long time and is one of my favourite body bars to use in the wintertime. Advice: If you purchase two massage bars you can get a free tin to hold them in. Facial Skincare: I have purchased a few of their face skincare because of the lack of extensive items used in their products. I have reviewed one of their products before which was Grease Lightening the review here. The fresh face masks are most popular but don’t last long (about 6 weeks) before you have to chuck them. I have no space for these (since they have to be kept in the refridgerator) so I’ve never purchased one. 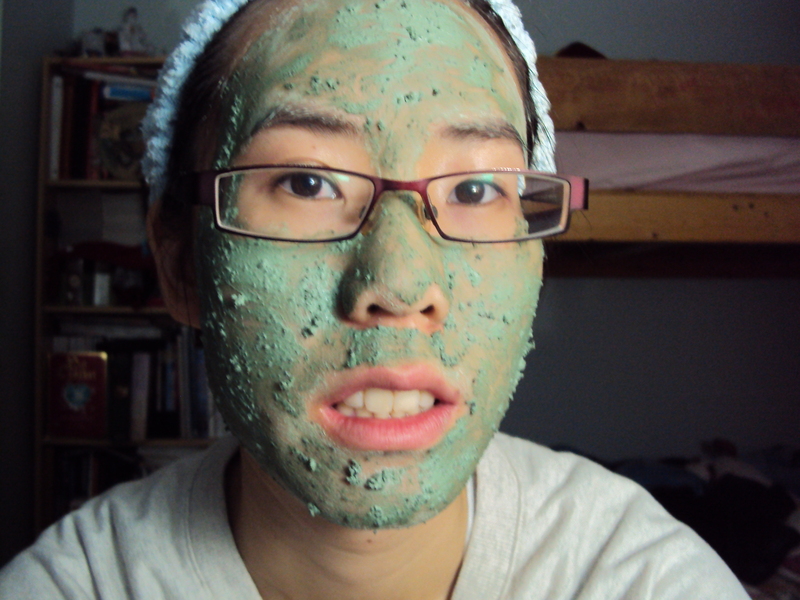 The only mask that doesn’t have the quick expiry date is the Mask of Magniminty and it smells… very minty. It is a great mask for those with oily skin and my skin loves it. Here’s a scary photo. They also have cleansers which are pretty cool but some must be kept in the refridgerator. For toners you got two choices a traditional liquid toner or have a spa-like experience with toner tabs. I like toner tabs as they feel really luxurious though my neck gets a little tired after using them. All you have to do for the toner tabs is to drop one in hot water and allow the steam in the water to have extra properties adding moisture, controlling oil, or just destressing your face. It’s a lot of fun and even though you might not get extra benefits it still feels extremely nice. Advice: You can purchase a set of 7 toner tabs for $9.95CDN (a $3.70CDN saving!) only for the $1.95CDN line not the $2.95CDN line. So all these products I would totally recommend to those starting off with LUSH you don’t have to go out right now and buy everything I mentioned in this post what is most important is knowing your preferences for scents and just picking up what you like. Hopefully I’ve made this post informative for those new to LUSH and I apologize for it being so long… there’s just so much products available at LUSH! *Note: All stock photos are taken from LUSH Canada’s website.